A couple with a past spends an unexpected, yet magical, Christmas week together at the shore, where serendipity abounds. A fourth bestselling Holiday Brides novella on Kindle! Three years ago, Sarah Anderson made a terrible mistake. After one too many glasses of champagne at her best friend&apos;s wedding she woke up in bed with the best man. To make matters worse, he ran out on her and she never heard from him again. 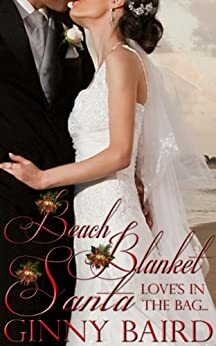 When Sarah&apos;s gifted with Christmas week at her best friend&apos;s beach house, the last person she expects to run into is the handsome heartbreaker. But it appears fate has ensured a mysterious double booking, and he was given a key to the same place. With a winter storm raging on their secluded barrier island, it seems they&apos;re both trapped there together. Will their marooned status push them even farther apart, or heal past wounds and lead to a new start? All Matt Salvatore wants to do is escape from the world and enjoy some surf fishing. He never dreams a beautiful blast from his past will upset his get-away plans. But it&apos;s hard to think of leaving when he recalls how it feels holding Sarah in his arms. Yet, three years before, when he&apos;d thought they were getting close, she&apos;d literally sent him packing. He&apos;d nearly forgotten that heartache until he looked once again in her big, brown eyes. When they&apos;re suddenly thrown together for an unexpected beach vacation, old feelings resurface and hope reignites. But can Matt convince Sarah his feelings are real, when his resources are limited to what&apos;s at the house - and in his heart? A sweet, traditional PG-rated romantic comedy. Standard novella-length, approximately 25,000 words. Matt and Sarah were best man and maid of honor at Matt’s brothers and Sarah’s best friend’s wedding engagement party. This is where they found out they were bestowed the honors. From that very first night it was a love connection but neither knew it. So, by being thrown together to help plan and carry out plans for this wedding, they were able to get better acquainted. They seemed to hit it off right away. They could joke and laugh and talk about anything. Sarah saw everything she wanted in a partner. Yet, never having confidence due to her background she had a secret no one knew about not even her friends, which made her feel less than. Not to mention that her last two relationships made this secret a deal breaker so it was just best not to get involved with any man at all but especially some as wonderful as Matt. Matt deserved better than her than what she could give him. Matt on the other hand was so taken with Sarah in every way. He saw in her what he couldn’t find in any of the other women he had ever dated before. He was so wanting a relationship like his parents have. Sarah he thought was it. Three years ago at Robert & Elaine wedding she told him to leave. What he didn’t know is she thought is that they had done the nasty. When in fact she had fallen ill due to all the drinking she had done because she knew she could never have Matt due to her secret. Come see how these two come together on a dark and stormy night. Not knowing the other will be there and what will happen when the have to finally talk about what really happened that night and about their really feelings about one another. I really enjoyed this sweet and steamy love story. Of two star crossed lovers who have no idea that their hearts want what it wants and that they will not stop till they are with each other. Got it free on Amazon. I started Beach Blanket Santa and was loving it. It was the perfect holiday read. You have the somehow the two people are thrown together and stranded in a kind of secluded place for the holidays. You have the they have a bit of history thing. You have the Christmas magic that brings them together and it was just amazing. Until the very end. Sarah and Matt had met a few years ago at a wedding. They were both part of the wedding and they both liked each other from the start, though neither one realized it. In a twist of fate they both end up at this beach house for the holidays thinking no one else will be there. When storms come in and flood the roads and strand them together they are stuck together. At first it is a bit awkward, but quickly turns into a nice holiday read. A few years ago, after drinking a lot at her best friends wedding, Sarah wakes up next to Matt. She doesn't remember anything and pushes him out the door thinking he is not a good guy. She was obviously drunk and he slept with her anyway. It was a little annoying that she keeps thinking about how Matt ran out on her the next morning when it is she who pushed him out, but it didn't bother me that much. As for Matt he doesn't understand what happened. He thought finally he is getting closer to Sarah and she likes him right up until she makes him leave. At first when they meet again at the beach house they kind of dance around each other since neither really knows what happened that one night, but it does get resolved pretty quick. They talk and when Sarah finds out what really happens she realized that Matt is a great guy. He really was incredibly sweet and just amazing. Too bad if he knew what had happened, what is going on with her he won't want her is what Sarah keeps thinking. So Sarah and Matt grow closer as they are stranded together for the holidays. Neither of them really mind that they are stranded as then they just have time to get to know each other better and have the christmas magic work on them. So I was loving this story. Matt is so sweet and he obviously cares for Sarah, but Sarah just doesn't think it would work longterm. Not that she doesn't want it to, but the if Matt knew everything he wouldn't want her thing. So they are finally able to leave the beach house, the storm has passed, and Matt tells her he wants to keep this going. He really likes her and he wants to see her when they get home. What does Sarah do? Say she doesn't want to, she doesn't want this, and leaves. She lies instead of telling him her secret so he will leave her. So then you find out the big secret. What is is? She can't have kids. She was sick when she was younger and that made her sterile. She has two, count them two, boyfriends who wanted kids and so those relationships didn't work out. Since the whole two guys she tried to date didn't work out because of the kids issue that means that no man will ever want her. Cause yeah, that makes sense. It was...It made me angry. She was not upset that she can't have biological kids. She thinks there are other options and everything will be fine, but no man will ever want her because she can't have kids. I...it annoyed me so much. It is one of those why not tell the guy so he can make his decision based on all the facts? I for one have never wanted kids. I know it is different if you can't have them, but it still is no biological kids. I have always been upfront about that with guys I dated and it was never an issue. Well there was one guy who said he definitely wanted kids so it wouldn't work out, but because I get that stuff out of the way pretty quick it was not a big deal. We became friends and are still friends to this day. Not a big deal. You tell the guy and you figure it out. For some people yes, it is a deal breaker. But for others it is something that can be okay. To have that be the big horrible thing that happened to her...it just made me angry. Some ladies cannot have children for whatever reason. This was like saying there is something wrong with them, something that will make no one ever love them enough to get over that. Argh. I did not like it. Besides that fact I hate when people make decisions for other people. Like Matt is a great guy, the best guy I know, but he will not want to be with me if I tell him the truth so I will just make the decision for him to leave. I hate that! Especially when it is for a lame reason! You dated two guys! Two! That is not any kind of representative sample of anything! Of course everything works out and they live happily ever after, but those last few pages with Sarah being super lame just ruined the rest of the story for me. I was loving it, and then that happened and I just couldn't get over it. It just is unfortunate as it would have been a great holiday read, but now it is going on the not to be read again list. Sarah and Matt end up together one night after a wedding of Sarah's friend and Matt's brother. However, both misunderstand the end that night came to. 3 years later they end up sharing a beach house. During this time, they both get to know each other better and begin to have feelings for one another. However, when Matt shares his feelings and suggests a deeper relationship, Sarah is reluctant to start anything because of a secret she's been keeping from him. The ending was great. Just in time, Sarah shares the truth and Matt's response is satisfactory, with no hesitance to what he wants. After her best friend's wedding she woke to find she had slept with the best man. She couldn't remember the evening but she was embarrassed. Matt still thought about Sara even after 3 years. i was left with such a happy feeling for the couple in this story at the end that they got their HEA. This book was such a nice read with a flow that kept me interested until the end of the book.. Well worth your time to read.